The United States may keep shedding jobs to foreign countries, but it cranks out new occupations like no one else. Here are just five of the hottest you can get into now. Experience/skills: Associate degree in a technical field and extensive training. People skills also come in handy. 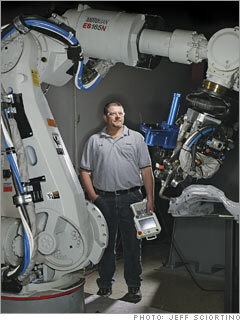 Back in 1990, Matt Zeigler was pulling 12-hour shifts as an arc welder for a forklift manufacturing firm in Indiana when a technician in a white lab coat came into the factory to work on a new $85,000 robotic welder. "I said, 'Why aren't I doing that?'" Zeigler recalls. Self-training eventually got him out of blue-collar work and into a top robot programming position at Motoman in Dayton, Ohio, one of a growing number of industrial robot manufacturers that train humans to make sure their products perform as advertised. Industrial robots, once a fixture in the auto industry, now are doing everything from analyzing blood samples to mixing cocktails. The latest innovations include multi-armed robots with vision systems and enough machine intelligence to read labels and pick out the parts they need from nearby bins. Zeigler, 35, spends most of his time behind a PC and a custom hand-held controller, calibrating the robots' moving parts to be in just the right place at just the right time. He is also on the road a lot, acting as salesman, engineer, and installer for Motoman's customers. "I wear a lot of hats," he says. Far from eliminating jobs, Zeigler says robots are "creating better jobs and better-paying jobs. They're just more technical and not as repetitive."